There's no doubt that fruit smoothies are profitable menu items. 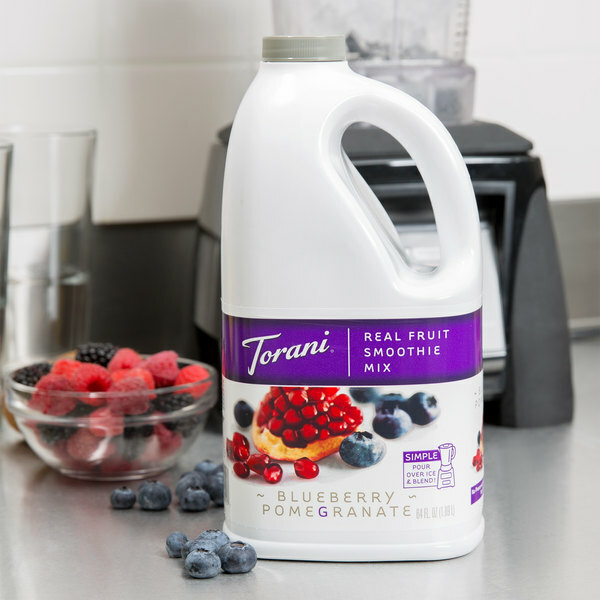 Make sure to enhance your bar, coffee shop, or cafe's drink menu with a variety of flavorful smoothies, including a top-selling blueberry pomegranate-flavored smoothie made from this Torani 64 oz. mix! This mix delivers a refreshing blend of blueberry and pomegranate flavors and vivid color, while its large capacity means you'll be able to satisfy dozens of customers before needing a replacement. The 64 oz. container also features a large handle that makes pouring easy and a resealable cap that's great for keeping unused product fresh. Save time and costs from buying smoothie ingredients and lessen kitchen preparation time with this premade mix that's made with real fruit, no artificial colors, and no artificial flavors. Simply pour over ice and blend - it's that easy! Blueberry pomegranate is a mix I have never thought about doing before but they go really well together. The blueberry does not over power the pomegranate like I thought it would. The flavor was not as rick with the blueberry for us. we enjoyed the mango much more. The price is good for making smoothies but we used these for our own in house enjoyment. The blueberry pomegranate smoothie mix is great and truly divine on taste. The mix is a great price and so fresh. Love the easy pour jug as well. Love the Torani smoothie mixes for my café. The blueberry pomegranate fruit smoothie mix is great and full of great vitamins. The blueberry flavor is exceptional and makes a great drink for our immunity booster. The blueberry pomegranate fruit smoothie mix is delicious. The berry flavors are great and full of antioxidants. I love using this mix for our green tea. I love making this smoothie for a mid-morning snack. The blueberry pomegranate flavor is very real and the mix is such a great price. A great quality product. We tried this as one of our smoothies in our coffee shop. The taste is good but it was just not a big seller so we will not order again. We use all of the Torani fruit smoothie mixes in our shop for making our smoothies. This one is good but I prefer the others over this one. Don't get me wrong it's still good, but I just prefer the other flavors. Simple to use and made of real crushed fruit. One of the best tasting smoothie mixes that I have every had. The blueberry and pomegranate a two super fruits and the flavor is wonderful. The perfect mix for creating top notch beverages. This blueberry pomegranate fruit smoothie mix is a great unique flavor! It is easy to use, just simply add ice and blend and you have a perfect smoothie! Very good smoothie mix. Very easy to mix with the convenient pumps (purchased separately). Customers love the taste and freshness of this product. The price is very good per serving. This smoothie syrup tastes great. It's definitely very artificial tasting but that's what I like about blueberry flavors. They're always stronger than the real thing. Excellent taste! Some smoothies taste artificial and this is a genuine taste of fruit purée, we mix ours with ice. No artificial sweeteners, dyes, or corn syrup which is awesome that it's so natural! It is sweet tasting but people love that. 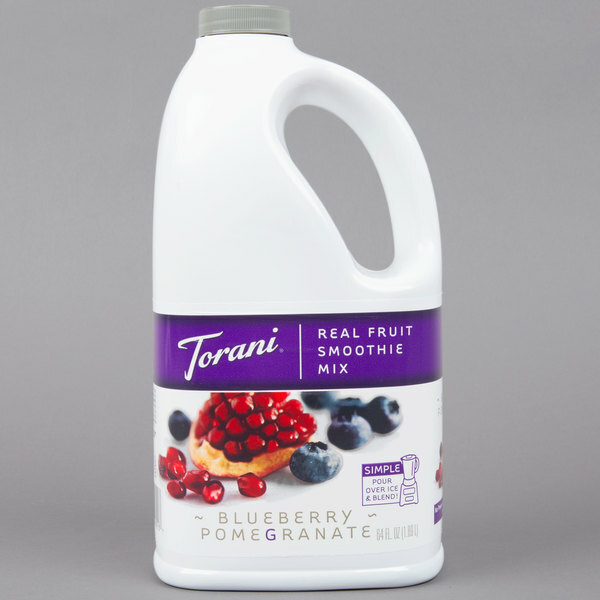 Torani 64 ounce blueberry pomegranate fruit smoothie mix is amazing. We love the taste. Perfect for any deli, bar, restaurant, or even at home. You will love this product. Grab a bottle and try it out. the pomegranate flavor has become increasingly popular. It mixes well with many other flavors and especially blueberry. It creates that great flavor without the hassle of the seeds. This is a good flavoring mix. The customers are in love with the blueberry pomegranate smoothie mix they are so glad we found it again and have it back in stock. We have been purchasing another brand of smoothie mix that I have to order in very large quantities. I switched to the Torani in the Blueberry Pomegranate and our customers loved it. Getting ready to order more! This tastes amazing, plain and simply good. In fact our store has not yet purchased a flavor of this mix that is not amazing. People who do not like blueberries even like this stuff. Really good for hot July days. I liked the taste but when I did in smoothie the taste was not so intense. There are cheaper products with higher performance and longer life. We appreciate your review, Sergio! If you are looking for a different product that will better suit your needs, please contact our Customer Solutions team. This is a good additive to my berry smoothies, I use a small amount with fresh berries to add a bit of sweetness..I freeze it in a 2 oz soufflé cup and use like you would an ice cube..
sweet and great tasting smoothie mix! Mixes so well with Greek yogurt and ice or just ice. Beautiful vibrant color makes this even more fun to drink! We use this for a blended smoothie. You can add to milk and ice or just add water and ice and blend. It makes a nice smoothie. Personally, I think it's pretty sweet tasting.